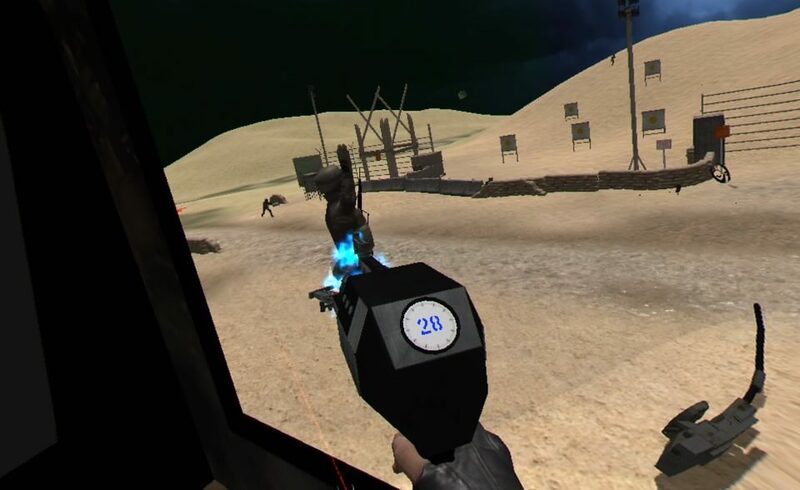 I think most of us early VR adopters have been looking forward to not only seeing what new ways we can experience games, but what VR games can bring to classic genres. What I have never seen before is just how VR handles placing a full arcade game in a virtual space and playing it in both traditional and newly immersive ways. 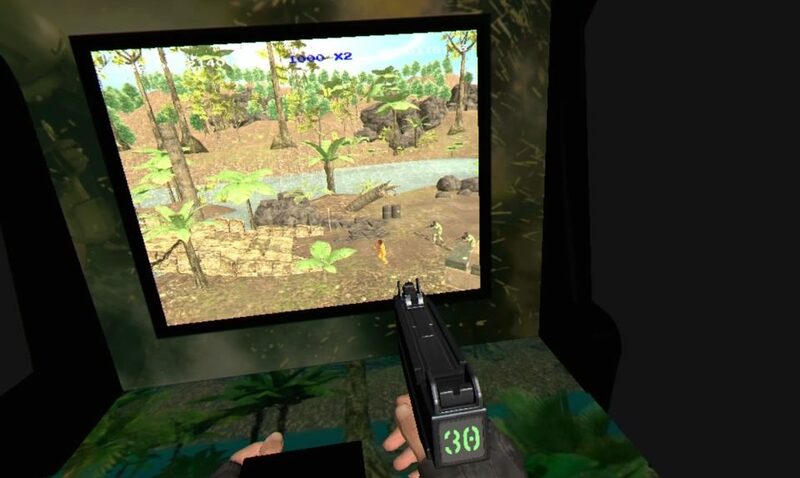 Clearly inspired by classic shooters like Operation Wolf, you take hold of a gun on an actual arcade cabinet and begin to unload at all sorts different enemy soldiers and vehicles in your quest to conquer all the stages. With all 3 PSVR methods of controls available, if you have the Aim or Move options, just stick with those. The DS4 is tracked and plays like the Aim controller, but is just not quite as comfortable, or fun, as the other options as it locks your hands in front of you. You only get one gun no matter what method you pick, so while the Move controllers allow you to throw grenades with your left hand, the other methods just assign grenade tosses to buttons. That’s about it really, enemies appear from the right and left of the screen or pop up in windows or from behind obstacles scattered around the ever-panning environment. You can choose “immersion” or “classic” mode with latter placing you in front of the arcade cabinet as if you would in real life and the former placing you right next to the screen where you can actually lean in and see further left or right, as if looking through a window and for me is the way better way to play. If this sounds dull to you, which it’s not, and you need more convincing there is also immersion mode! Classic mode lets you play like it’s 1987! Immersion mode takes you “inside” the game instead of the overhead/side view of the action. 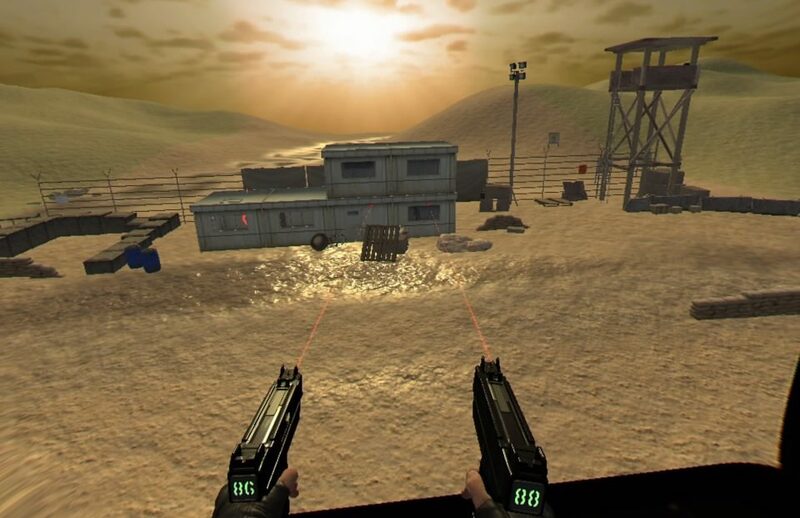 Throughout each stage are certain icons that can be shot which momentarily pause the action and put you in a first-person mode inside that game. Many of these moments involve, just shooting from cover or driving through the stage while shooting, which is great with dual moves as you have to steer with 1 hand while shooting with the other. You may be placed in a chopper, shooting from the skies or in a fighter jet or boat with mounted machine gun. These immersion moments break up the gameplay wonderfully and spice up the action nicely. Each of the 6 stages has 6 levels and 3 stars each. In order to unlock more stages, you need to get those stars. Those stars are stage specific goals like getting a certain number of headshots, not killing civilians, running over a set amount of enemies with your jeep or a host of objectives which add some nice goals keeping Warcade feeling fresh. It won’t take too long before you are forced to revisit past stages to get that 1 star that eluded you on your previous attempts but thankfully each stage only lasts a few minutes so multiple plays never really get a chance to feel old before you have reached their end. Immersion mode literally puts you in the game! The visuals here are probably the most disappointing aspect of the game. The stages are washed out and don’t carry a lot of detail but are serviceable. The guys you are shooting at look like army men and, excluding immersion mode, look just fine as they are usually so far away that details would be hard to see anyways. Vehicles and buildings lack any real detail and look more like basic geometric shapes twisted together to form those objects. Pop-ins and outs are rampant but mostly occur on the right and left sides of the play area so don’t really affect the action to much. Given the nature of the game the look works and when combined with the variety of options presented in immersion mode, it’s easy enough to forget how lacking this can look and focus on just having fun taking out the bad guys in all manner of ways. The presentation may also be saved by some much better audio. Guns all sound great, enemies yell upon death and vehicles all sound like they should. If you want to change up the music, you can go with visceral silence, some techno jams or more traditional actiony rock tunes. Other then the visual foibles at play, there really isn’t too much to whine about here. Some of 3-star goals can be a little tricky to get, but I have yet to encounter one I haven’t been able to get after 1 or 2(or 5 or 6) attempts. Some can feel a little unfair at 1st, but as you get better they can become easier and after you achieve that goal, you no longer have to worry about it so just focusing on only 1 objective becomes very easy. Besides the typical machine guns, shotguns and sniper rifles other more eccentric weapons pop up like throwing knives, explosive bow and arrows, freeze grenades, a gravity gun and a few more amusing options. The classic mode also has limited ammo making you dial back just how often you pull the trigger while immersion mode lets you unload with reckless abandon. If you can’t tell, that’s an enemy solider on the end of my gravity gun! There is a host of content to get through and every time I encountered a new type of immersion mode excited me, and there are plenty. The visuals are lacking, but the gameplay and content more than makes up for those shortcomings. This is a throwback title given a VR makeover that works great. It’s cool to lean into your screen and look around or toss a grenade from outside the cabinet. You also unlock power-ups that help you out and there are leaderboards for both modes that just keep track of you accrued score so the more you play, the higher you’ll place. 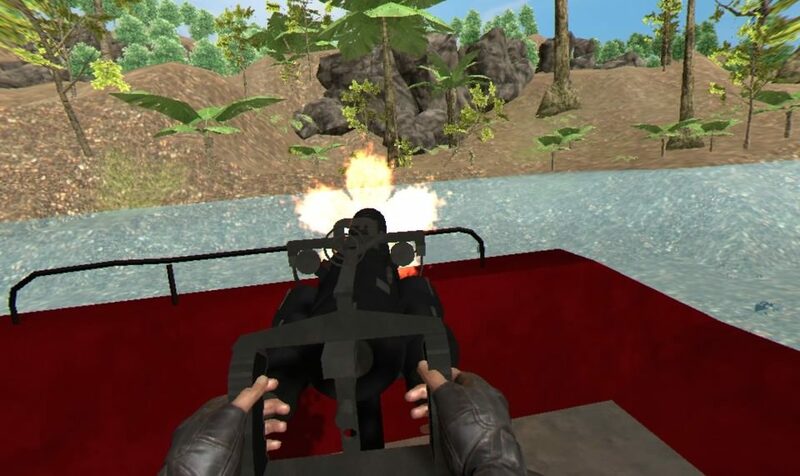 Operation Warcade is an awesome homage to classic cabinet shooters from the 80’s and 90’s that transitions great into VR. What would I pay? The $20 asking price is fine for this. 36 stages, a host of objectives, 2 modes and some great mix-ups in gameplay make this game feel fresh way longer than you might think. 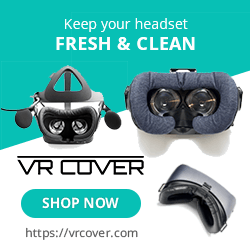 Ivanovich Games provided The VR Grid with a review code for this title and, regardless of this review, we thank them for that!